Irish 18th Century Landscape Painter: Biography, Watercolours. One of the most gifted members of the English School of landscape painting, George Barret junior was the son of the Irish artist George Barret Senior RA (1732-1784). 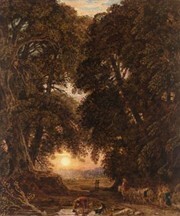 Barret's early landscape painting in oils was executed in the same style as his father, but afterwards he became celebrated for his drawings in watercolour by which he made his reputation. He exhibited at the Royal Academy from 1800-1803, before becoming a foundation member of the Old Watercolour Society of Painters in 1804, where his watercolour painting was shown continuously for 38 years. He espoused the style of Romanticism, although whether this was by choice or at the instigation of his patrons, is unclear. His earlier artworks were scenes of the Southern Counties of England, interspersed with an occasional Welsh landscape, but soon he turned to general "Claudian-type" compositions - so-called after the French painter Claude Lorrain (1600-82) who pioneered idyllic pastoral views - depicting romantic sunrises and sunsets. One of the better Irish landscape artists of the 18th and 19th centuries, his watercolours - in the opinion of several art experts - remain unequalled in their representation of bright sunlight and other atmospheric effects. He was also the author of The Theory and Practice of Watercolour Painting (1840). After a life of almost continuous work George Barret (Junior) died in 1842 at his house in Edgeware Road, London.  For more about watercolour landscape artists like George Barret junior, see: Irish Art Guide.